Martin with Merlin and Kevin with Peppe. 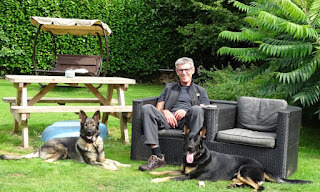 Front left is Chris with Nessa ( Formerly Elsa) and front right is course Instructor Graham with our new spare dog Bill. We always like to run a spare dog on the course just in case one of the dogs doesn’t successfully complete the course. If this happens then the spare dog can be allocated and the handler doesn’t have to come back and do another course. We brought Bill onto the course at the end of week 3 because we had concerns that several of the dogs were not performing particularly well on their tracking exercises. We seem to have come through that sticky patch and all of the dogs are now doing extremely well on all of the exercises. The handlers are certainly much happier now. Hopefully Nessa, Brock, Merlin and Peppe will continue performing as they are and Bill will not be required. Ones things for sure whether Bill is required or not he is loving every minute of the course. Bill is handled by course instructor Graham. When Bill is not being trained on the course he lives with Graham and his family and enjoys his home comforts. Bill and his brother Ben were purchased from Lorockmor working dogs for our January 2019 Police dog course. Here they are relaxing in my garden after bringing them back from Lorockmor in Shropshire earlier this year. They have the same father as Merlin who is on the current Initial Police dog course. Here are the boys sleeping in our kitchen after tiring themselves out in the garden. Bill only a few weeks before he came onto the Initial course. As always I am extremely grateful to Chris and Jake for their dedication and hard work in looking after Bill. Here is Bill with Chris on his first training session. Also I would like to thank my invaluable helpers Mary and Margaret who looked after Ben and Bill for a short period until their full time puppy walkers were able to take them. For anyone wondering what will happen to Bill if he isn’t required he will be allocated his own full time handler at the end of the course. With all the training he will have received he will only require a short re-handling course with his new handler. As I have explained many times in my previous blogs the General purpose Initial Police dog course is the most intense and demanding Police dog course that there is. For new comers to the blog I will outline again what the course entails. The dogs are taught basic focus and control work such as recall’s, stays and heelwork, which underpins most of the core exercises that they do. They are taught to search for outstanding items of property the subject of crime or lost property. The dogs must indicate to their handler they have found the item without touching or disturbing it. It is important that they do not touch the item if it is the subject of crime as there may be DNA on the item which could identify the offender. Here is Nessa having located a wallet in long grass and has gone into the down position to tell her handler Chris she has located it. They are taught to track and search for outstanding criminals and missing vulnerable persons. (Tracking is the following of a person’s individual scent trail) Here are the teams hot on the trail of an offender. The dogs are taught to deal with violent or disorderly crowds, to detain a fleeing criminal and to protect their handler from attack. Here is Bill in the very early stages of learning to detain a fleeing criminal. The dogs are taught how to negotiate a wide range of different type of obstacles. Bill is a very large young dog who is still only just over 11 months old and so we have to be careful not to overload his joints. Hence the shallow running board which will remain in place for now. With an ever increasing elderly population in our area the operational Police dogs spend a lot of their time searching for vulnerable missing elderly persons. Our dogs are trained to search, locate and bark to alert their handler if they locate someone. In these circumstances the dogs should not bite the vulnerable person even though on occasions the missing person is confused and can try to push them away. This is where training and the temperament of the dog is so important. Here is young Bill in the early stages of locating and barking at a hidden person. In all dog training the bond between dog and handler is a crucial part of any success. To develop that bond the handler needs to patiently and calmly show his/her dog what is required of them, never lose their temper and to never underestimate the value of spending quality time with their dog and the importance of play. Loss of temper, anger or worse still physical or mental abuse has no place in dog training or in the relationship with our dogs because it makes for a confused unhappy dog and destroys trust. I mentioned at the start of the article that some of the dogs struggled with their tracking in the first few weeks and it was a cause for concern. Working in a large rural area such as ours requires a dog who is exceptionally good at tracking down offenders or outstanding missing persons. We strongly suspected the dogs were finding it difficult because the lack of rain over the previous 3 months meant that the soil under the grass was bone dry and very little scent was coming from the ground as the tracklayer walked over it. Our suspicions were correct because since the rain arrived the dogs have not looked back. Here is Martin and Merlin in the early weeks following a trail which has been laid for them . Although Martin is a first time handler I have been very impressed with his ability and the relationship he has with his dog Merlin. Merlin is a natural tracking dog and I think they are going to be a first class team. I hope to do a final blog at the end of the course showing how they all get on in their assessment week. This week I travelled up to Kazzardsway German shepherds in Manchester to collect 9 week old puppies Obi and Oscar to join our puppy program. 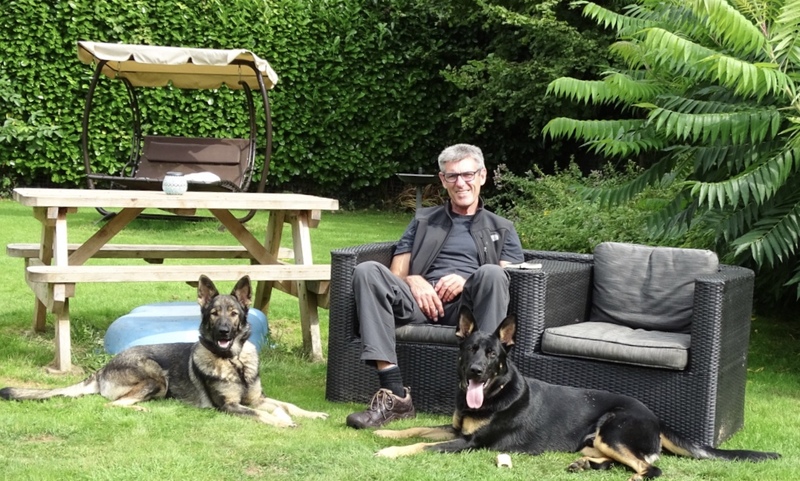 Bernard Horton of Kazzardsway German shepherds has previously supplied Police dog Oppo ( Formerly Eric ) TPD Nessa ( Formerly Elsa) TPD Nero,TPD Nicky and TPD Niko to us. Bernard came to Police dog Oppo’s ( Eric) passing out parade in May this year and will be coming to TPD Nessa’s ( Elsa) passing out parade on December 13th should she successfully complete her course which I’m sure she will. On my arrival at Kazzardsway it was a pleasure seeing mum Jazz still having access to her pups and is pictured here keeping watch over them on her viewing platform. Here are Obi and Oscar with Bernard and his wife Karen just before I took them back to Devon. I never heard a sound from them all the way back. Having travelled back with Obi and Oscar I gave them a good leg stretch and run around our garden before taking them to HQ Middlemoor to allocate to their new puppy walkers. Once I arrived at HQ I was greeted by enthusiastic first time puppy walkers eager to meet their new pups. Obi has been allocated to Stuart and Alison who live in Crediton and they have renamed their pup Jay. Oscar has been allocated to Andy Parsons a serving Police officer whose ambition is to one day join the Police dog section. He lives in Plymouth with his wife and 2 children. They have renamed him Arnie. Andy is pictured here with his dad Trevor and Arnie. Hopefully Jay and Arnie will follow in the footsteps of their older Siblings Oppo and Nessa. I have no doubt they will give their new puppy walkers lots of entertainment and fond memories to look back on. Jay and Arnie have both settled well into their new homes. This morning Stewart sent me this picture of Jay practising feeling his first collar. Looks a natural to me. In my last blog I reported on collecting Ginny, Rogue and Rebel from Lorockmor working dogs in Shropshire. Ginny pictured centre with Mary was only a temporary arrangement with Mary yet again very kindly volunteering to look after her while we found her a permanent puppy walker. I am happy to report that Ginny has now joined her new permanent puppy walker home with Dad Keith, Eleanor, James, mum Marian and Oliver who live in Exeter. Jay and Arnie will be joining Rogue, Ginny and Rebel in the Janaury 2020 Initial Police dog group. I will be visiting Jay, Arnie and Ginny on Monday to see how they are all getting on and all the 5 pups in the group will have their first training session together next Tuesday. I will be doing a separate blog later this week on how all the rest of the pups in our program are coming along. From Larry, Ella and me bye for now. Last week I collected Ginny, Rebel and Rogue from breeder Ian Morgan of Lorockmor working dogs in Shropshire to travel back to my house on the start of their journey to become future Police dogs. There were 6 pups in the litter and after conducting my puppy tests I selected our 3 pups. It wasn’t easy to select 3 because all 6 were very confident, playful, and driven and my guess is they all have the potential to be working Police dogs. This is a repeat mating. From the previous mating we took Merlin who is now on week 5 of the current general purpose initial police dog course with his handler Martin. They are both doing extremely well on the course. They travelled well on the 3 hour journey and because they all look so much alike the first job on arriving at my house was to put collars on the pups. In the past I always used to take the pups to Police Headquarters to meet the puppy walkers before travelling to their new homes. More recently because I’m lucky enough to own a house with a very large enclosed garden I now take them home so that they can run around to their hearts content and unwind after the journey. On arriving at our house you can see from the video’s the pups wasted no time exploring the garden and you would never have guessed they had just been on such a long journey. They all took a shine to a large squeaky toy and spent ages trying to get it off each other. There wasn’t any one pup that was particularly dominant and they all had varying degrees of success stealing it from each other. Here are a few more pictures of the pups enjoying the garden before leaving for their new homes. After 3 hours of charging around and their batteries definitely running down it was time for the puppy walkers to take them to their new homes. Rogue will be living in Plymouth with Lyn, husband John and son Ian. They are our most experienced puppy walkers. Lyn’s family puppy walked Rogue’s older brother Merlin currently on the initial Police course. Ginny will be staying temporarily with Mary who lives near Launceston until we find a permanent puppy walker for her. Mary doesn’t want to puppy walk a puppy for the full term because she finds it too upsetting giving them up. She helps us out on a regular basis when puppy walkers go on holidays or weekend breaks. Rebel will be living in Exeter with seasoned puppy walkers Terry and Jill. They have puppy walked 12 pups their last pup being Henry the Dutch herder. Sadly Henry didn’t qualify as a Police dog but is now in training with the prison service. All the pups travelled well to their new homes and have settled in well. I visited all of the pups and their puppy walkers the following week. They are all playing, sleeping and eating well. They have had their first inoculation and health check with their local vet. My first visit was Rogue. He is going to be a very strong assertive character and has already challenged Lyn. He definitely needs an experienced and firm puppy walker which he has in Lyn. His favourite toy is a mechanical car and as you will see on the video he doesn’t like anyone taking it off him. Hopefully we are not encouraging him to chase real cars. He might look a cute little chap but my instinct tells me Rogue is going to be spending a lot of time on the naughty chair. One thing is for sure he isn’t going to back down from confrontation. Lyn’s husband John had been diving and left his dry suit on the chair. Rogue had never seen this before and came across it unexpectedly. My next visit took me to Ginny. Ginny is very much an explorer and gets herself into all sorts of situations. On her first night she got her head stuck behind the door of her cage. Climbing and forcing her way into places she shouldn’t be able to get into is her speciality which keeps Mary on her toes. I am visiting and interviewing prospective new puppy walkers this week and hopefully will identify a new permanent puppy walker for Ginny. I am not in any rush because she is in excellent hands with Mary. My final visit was to see Rebel. Just like his siblings Rebel is a very happy, playful puppy who has fully settled in his new home. He already has an incredible focus and desire to interact with people and he is already becoming very attached to Jill. Here he is doing some early recall work with Jill. Here is playing tug games with Jill. Having seen how well their older brother Merlin is doing on the current Initial Police dog course I am really looking forward to watching these 3 pups develop. Rogue, Rebel and Ginni will be on the January 2020 Initial Police dog course. Next week I will be going up to Kazzardsway German shepherds in Manchester to collect 2 more pups who are currently 7 weeks old called Oscar and Obi. Here is a video of Oscar and Obi with their other litter mates taken by breeder Bernard last week. Oscar and Obi will be joining Ginny, Rogue and Rebel on the January 2020 Initial Police dog course. ( Now Nessa) is doing really well on the current Initial Police dog course who start week 5 of the 13 week course this week. Also currently in our puppy program from Kazzardsway we have Nicki, Nero and Nico now nearly 4 months old. Here they are at puppy class today doing a group down stay. I am very impressed with these 3 pups and also with their puppy walkers in achieving this so early in their training. In my next blog I will be reporting on the current Initial Police dog course. I will also be reporting on all of our other pups Sydney, Star, Bill, Ben, Lola, Echo, Errol, Eddie, Eyke,and Ernie.